Slather the 3-4 lb. pork tenderloin in the Smoky Bacon Olive Oil and sprinkle Rib Rub on the exterior. Let sit. Heat your grill or smoker to 250-300 degrees and place the loin on the grill or smoker away from direct heat. Let cook 2-3 hours or until the internal temperature reaches 140 degrees. 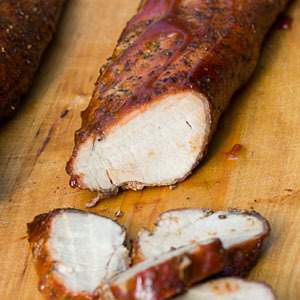 Remove the pork tenderloin from the grill and place in aluminum foil. Drizzle the Hickory Barbecue Riserva Balsamic Vinegar and some more Smoky Bacon Olive Oil all over the loin and then wrap in the foil and let sit. The meat will continue to cook and should reach a temperature of 145-150 degrees in approximately 15-30 minutes. Remove foil and serve.